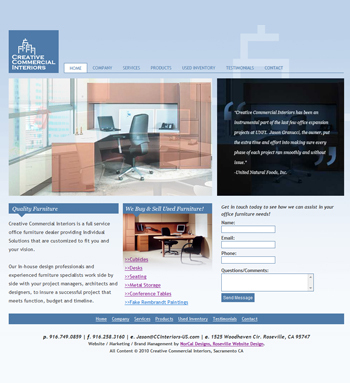 NorCal DesignsWebsite Design & Development: New Creative Commercial Interiors Web Site Design in Sacramento! New Creative Commercial Interiors Web Site Design in Sacramento! Creative Commercial Interiors is a full service office furniture dealer with 20 years commercial office furniture trade experience. Jason, the owner of Creative Commercial Interiors, provides suggestions and ideas that make the overwhelming choice of office furniture quick and easy and affordable too! We are currently working to optimize the Creative Commercial Interiors website for search engines as well as marketing via social media platforms. Or continued Brand Image management for the Web Design for the Sacramento based Creative Commercial Interiors includes functional goals for acquiring new customers while maintaining the aesthetic appeal!